Radnor Fire Company today announced its newest class of Firefighter 1 graduates from the Spring 2018 class. Graduating from the Fire 1 program at Montgomery County Fire Academy on July 18 were Vincent G. Albanese, Seongjong Oh, Jonathan R. Schrems, and Jared Scott. 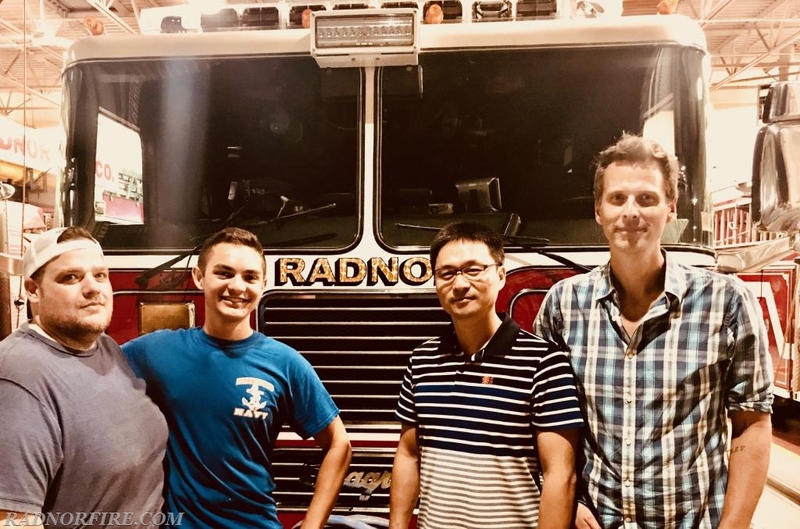 All four gentlemen are volunteers with Radnor Fire Company and completed more than 180 hours of classroom and practical fire ground training at Montgomery County Fire Academy between February and July of this year. Fire 1 certification encompasses four primary courses including Introduction to the Fire Service, Fire Ground Support, Exterior Fire and Interior Fire. Additionally, Fire 1 certification requires successfully completing First Aid, CPR and Hazardous Materials Awareness and Operations. Upon completion of the courses, these firefighters also successfully completed the testing for National ProBoard Certification which establishes an internationally recognized means of acknowledging professional achievement in the fire service and related fields. These volunteers completed the Fire 1 course work and fire ground training on weeknights and weekends while balancing requirements of both their personal and professional lives. Congratulations to Radnor Fire Company's newest Fire 1 graduates and to their commitment to serving the Radnor Community!